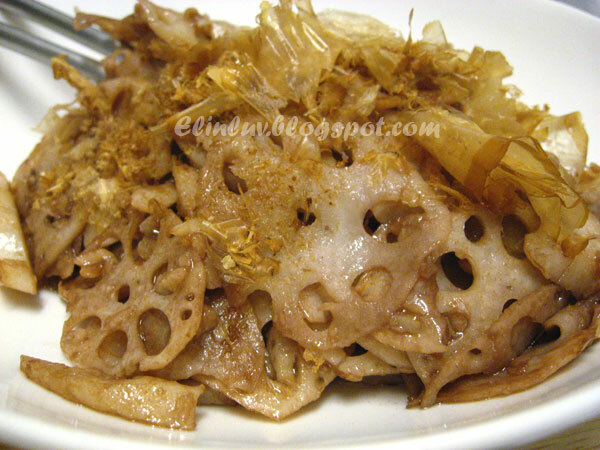 A flavorful lotus root side dish. I am very impressed by Roxan's simple yet delicious recipes from her blog -Kitchen Meditation . 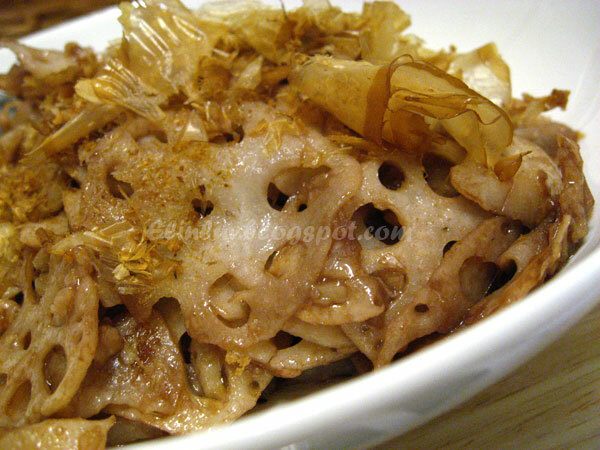 I read how she simmered lotus root in one of her post and I got the inspiration to create something like hers - it was so simple... instead of using soy sauce and mirin I substituted them with red wine and balsamic vinegar to flavor the simmered lotus root. The red wine and balsamic vinegar infused into the soft texture of the lotus root giving it such ooomphs that I knew straight away that this fusion dish will be a keeper for sure. If you are a balsamic and red wine lover you will love this side dish...goes well with any roasts or you can eat it just plain.....it has a very unique and beautiful flavor ! Call me crazy if you like but I love experiencing with ingredients :p One thing is for sure, my Piggies and the Wild Boar has lots of patience with me and my cooking :ppp Am I blessed ??? 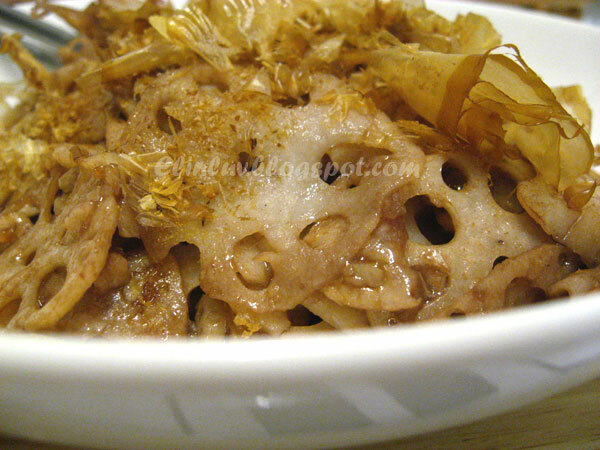 those bonito flakes blends well with the red wine and balsamic infused simmered lotus root..great blend! 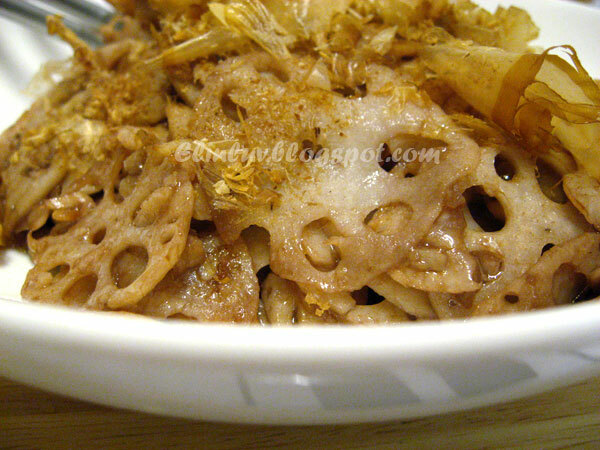 Soak the lotus root slices in water for 10 minutes, then drain and pat dry. In a saucepan heat the olive oil and lightly saute the chopped garlic. Add the lotus root. Cook, stirring and flipping constantly, until the lotus root is slightly cooked - be careful though as the pieces will start to break if you are not gentle. Add in the red wine and balsamic mixture and continue cooking until the liquid has evaporated. Remove from heat and top with some bonito flakes. I definitely will give this a go esp since red wine and balsamic vinegar are 2 of my fav ingredients. It would be a change from the regular mirin and soy sauce combi. Looks good! Very interesting dish! So far I never eaten lotus root but yours looks great.. 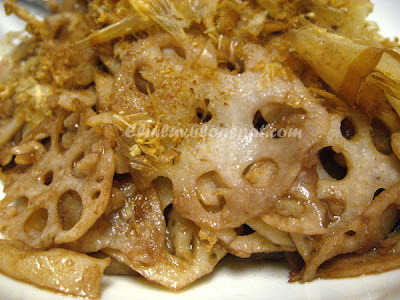 I love lotus root...next time I gotta try with your recipe. Looks totally delicious. I love lotus root and simmering it with red wine and balsamic vinegar sounds like a great idea. Will have to give it a try.